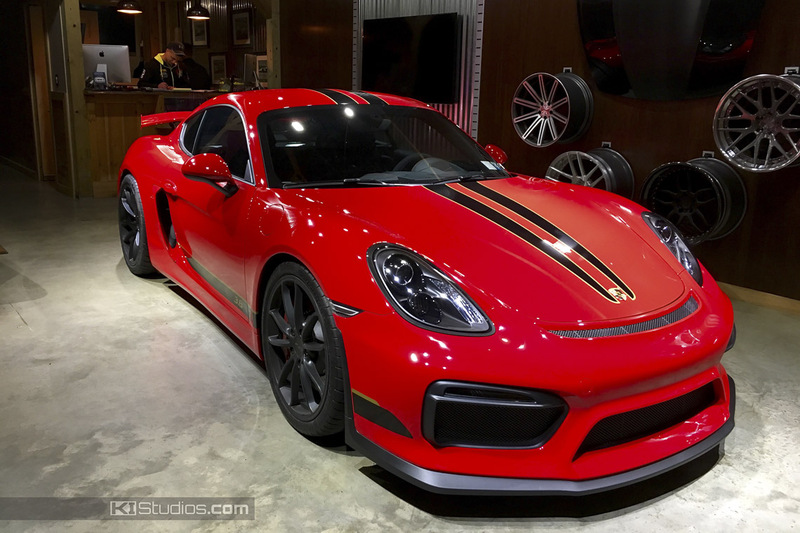 Ever since the first deliveries of the Porsche 981 Cayman GT4 started happening, it has been a hot car for our roster of Porsche stripes. 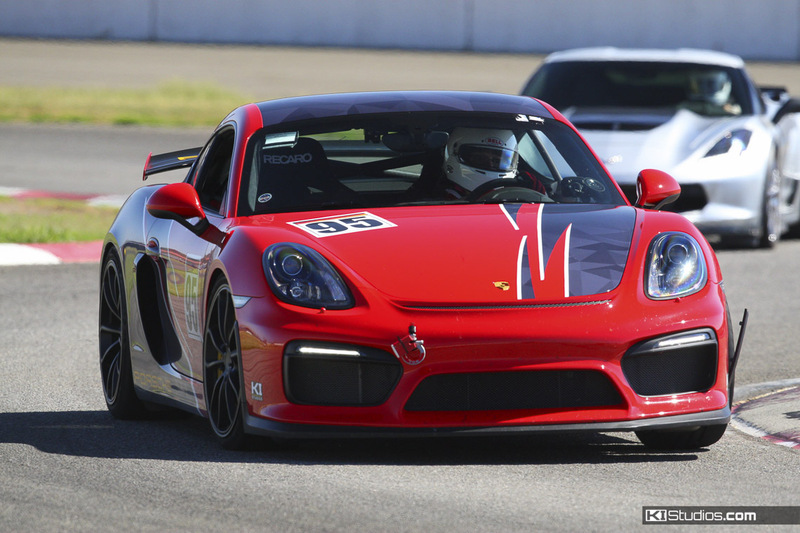 Almost immediately, orders began coming in for Cayman GT4 decals. 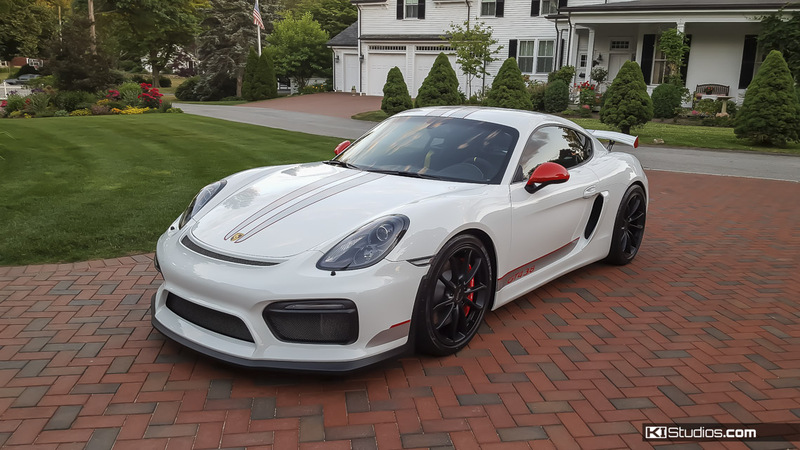 These Porsche Cayman GT4 decals have ranged from simple side stripes, to over-the-top Scuderia style stripes to wing end cap accent decals. 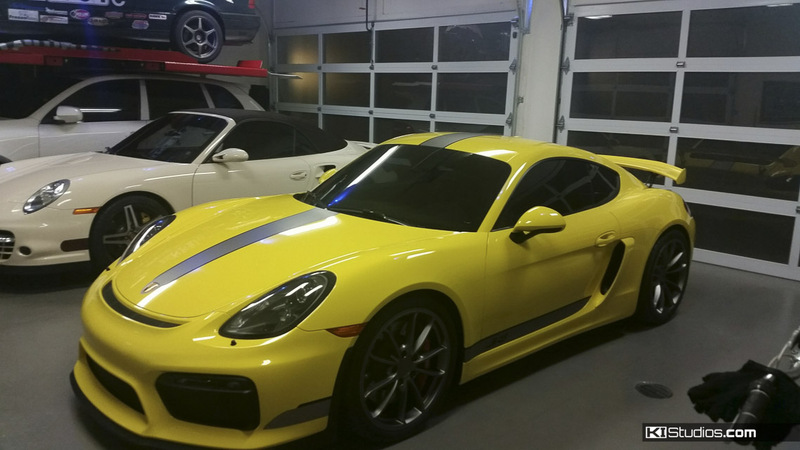 Not to mention, we also did a partial wrap on a Cayman GT4 track car just recently. Additionally, even before we offered them publicly, we installed 911R stripes are a few local GT4s. 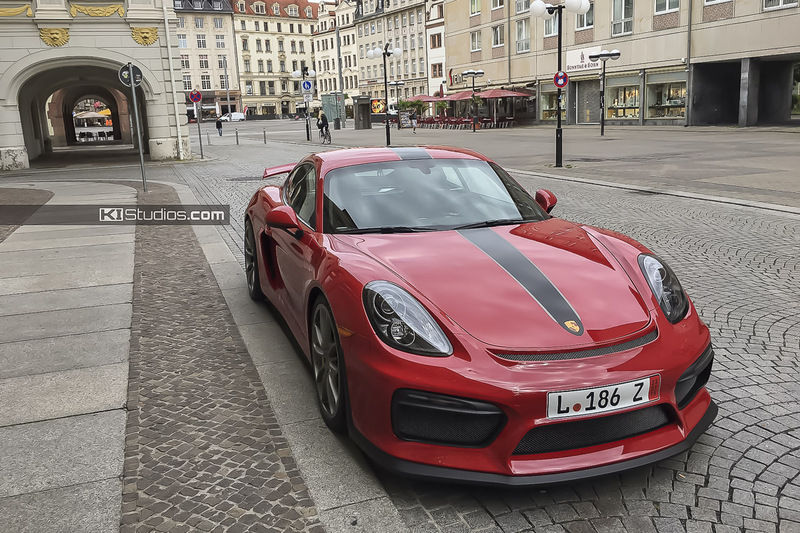 Porsche 981 Cayman GT4 decals seem to be very popular due to the nature of the car. 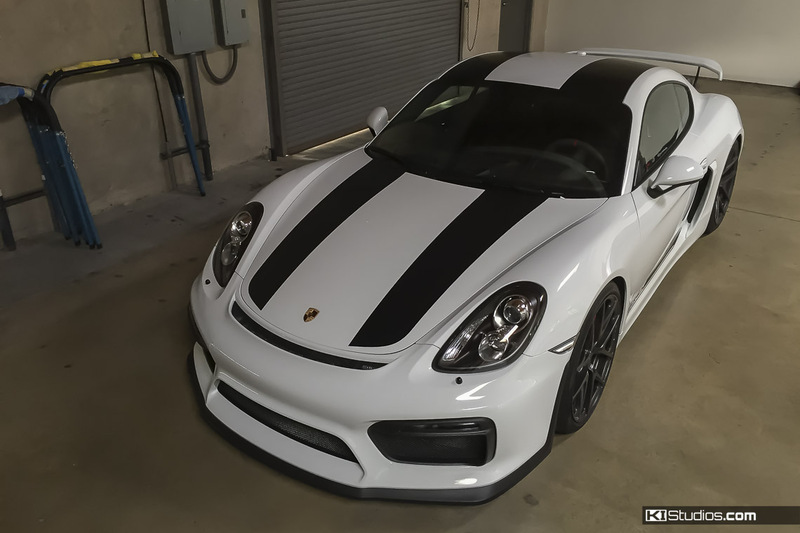 Cayman GT4 stripes fit the car so well because this isn’t a timid Porsche. 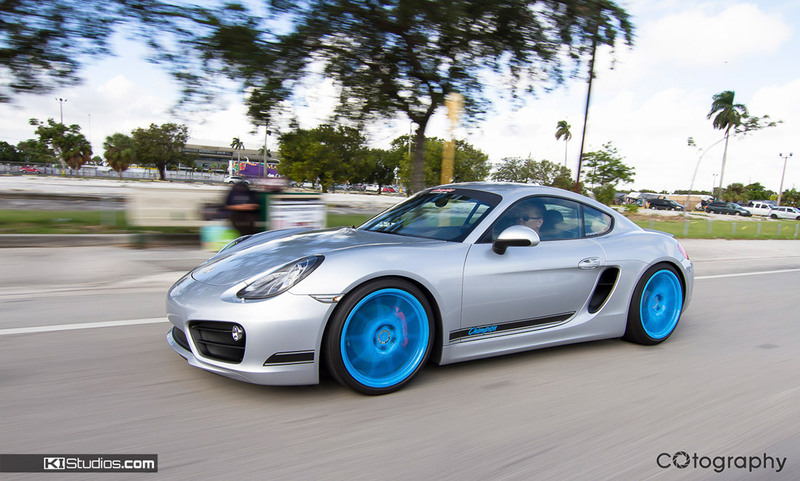 No, the GT4 is the hottest Cayman to date. 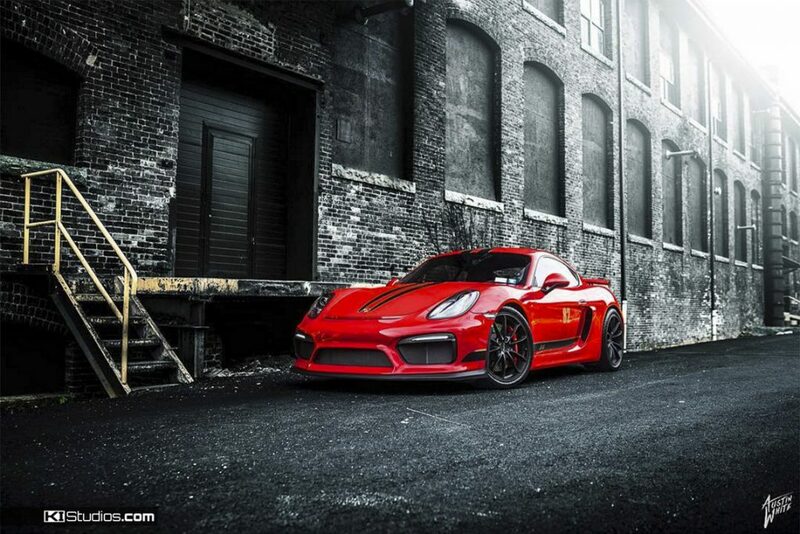 It screams track car with its 3.8 litre engine and huge list of upgrades over the standard Cayman. 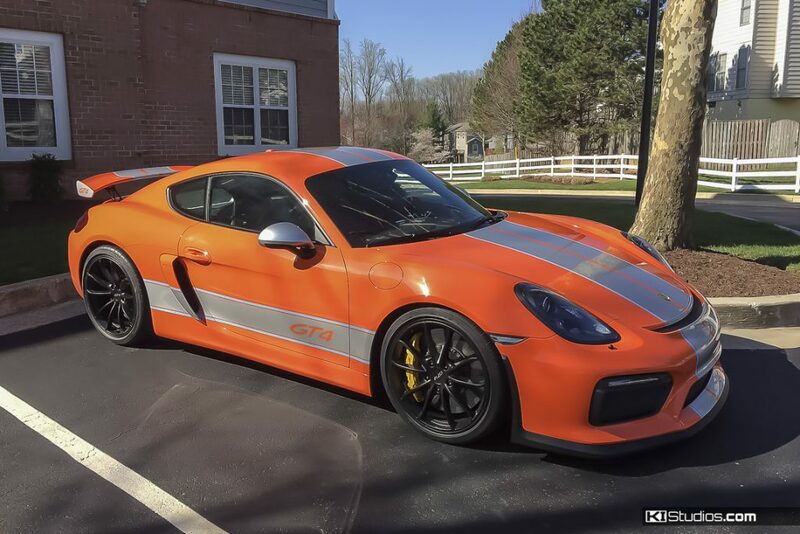 For this reason, many Cayman GT4 owners like the car to stand out even more, and stripes represent one great way to achieve that effect. GT4 partial wrap on the race track. Yellow Cayman GT4 decals to match the calipers. 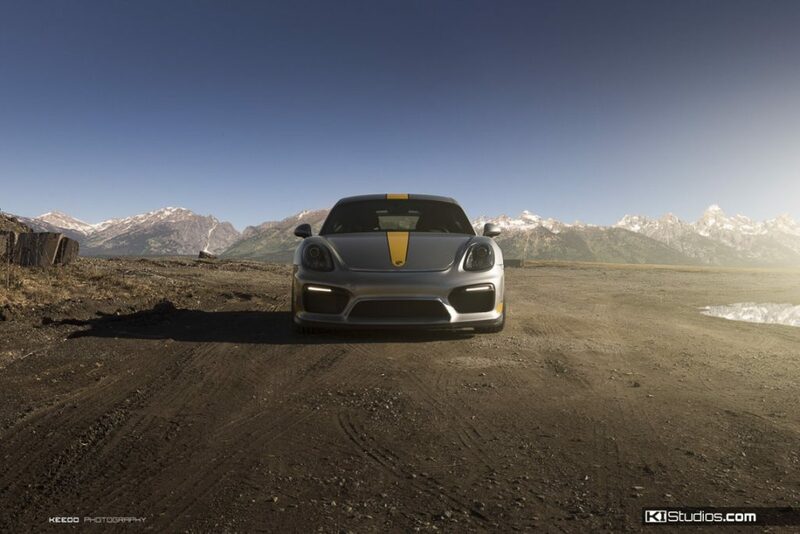 Scuderia-style stripes for Porsche Cayman GT4. 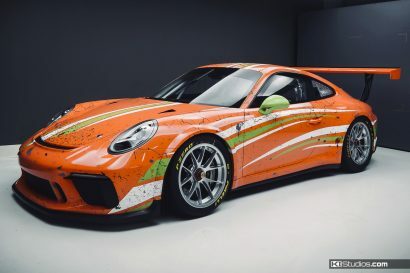 911R Cayman GT4 stripes can be ordered for DIY installation. 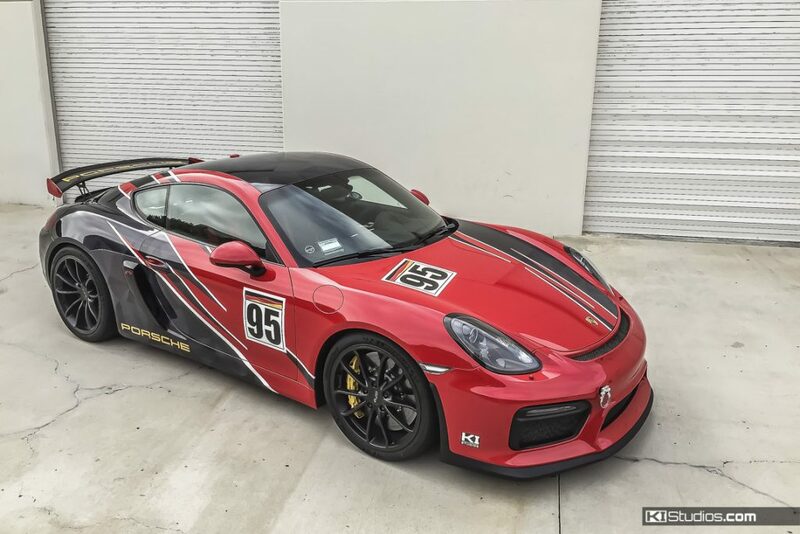 There are many ways you can achieve the custom effect using Porsche 981 Cayman GT4 decals. Firstly, one of the best ways is to tie in the stripe colors with colors already on the car. 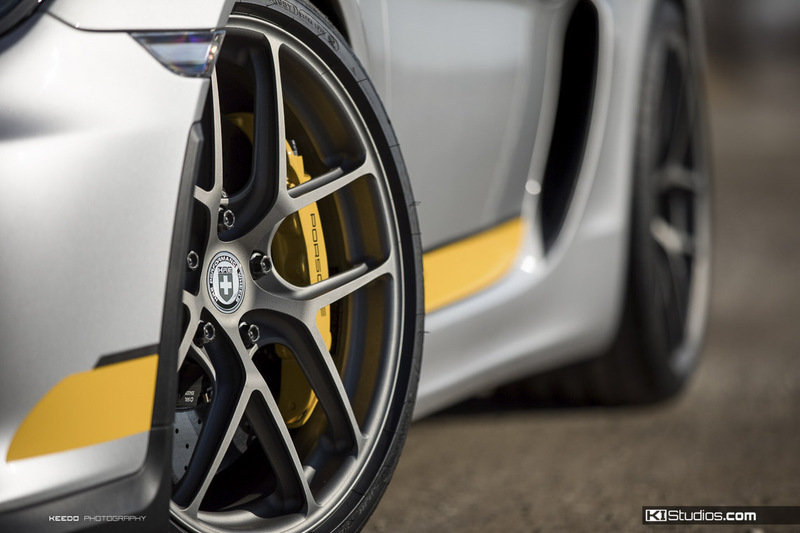 For example, if you have the yellow Porsche Ceramic brakes, you can match the Cayman GT4 decals or stripes to those. In fact, the actual yellow vinyl we offer our Porsche stripes in is matched to that same yellow caliper paint. Matching accents in your stripes with your wheels is always a safe bet. Moreover, you can also add a new color if you balance it out. Say for example your car has no blue anywhere, but you want blue stripes. 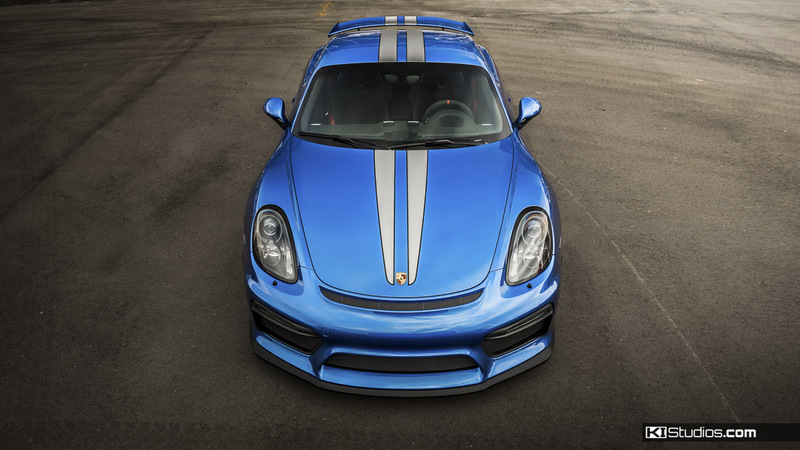 By installing bold stripes, like our Cayman GT4 Stripe Kit 006, the dominance of blue is strong enough that it can stand on its own. If you insist you want to tie the new color in a little better, you could have your side view mirrors wrapped in the same color vinyl to match. If you have wheels in the same color, even better. Don’t overdo it though. There is such a thing is too many accents. Some people get carried away and they match their stripes, wheels, side view mirrors, but then also add more accents throughout the car… such as the grille surrounds, door handles, rockers, etc… and it’s just way too much. Keep it classy. Another great alternative with the aggressive Porsche 981 Cayman GT4 is to wrap the car, and add stripes over that. 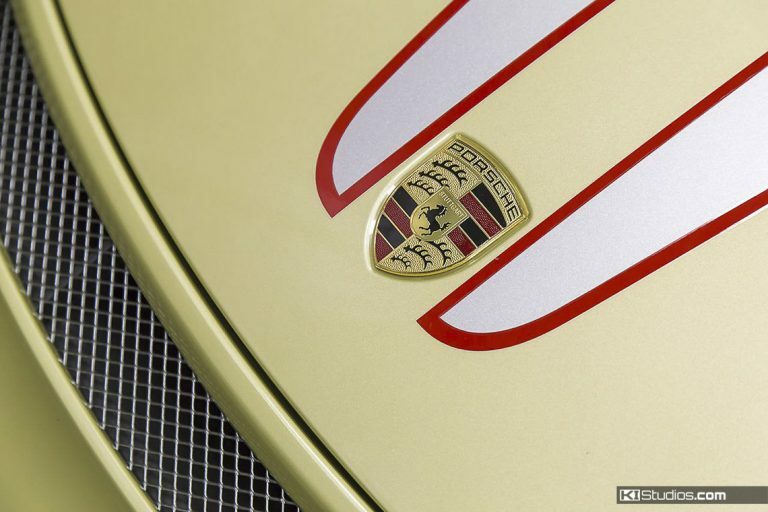 In fact, this is quite popular with many Porsches, not just the GT4. 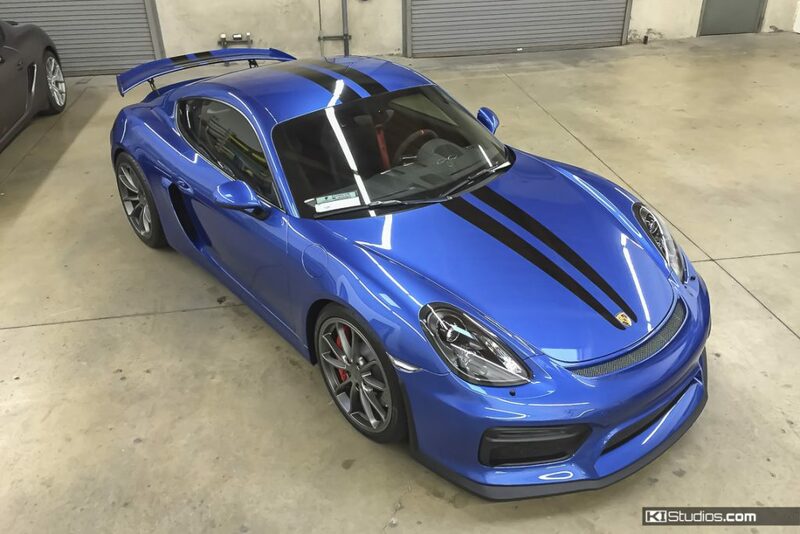 Perfect example is our shop 987 Cayman S. It’s wrapped blue and has Cayman GT4 Decals Stripe Kit 007 Scuderia style stripes over that. 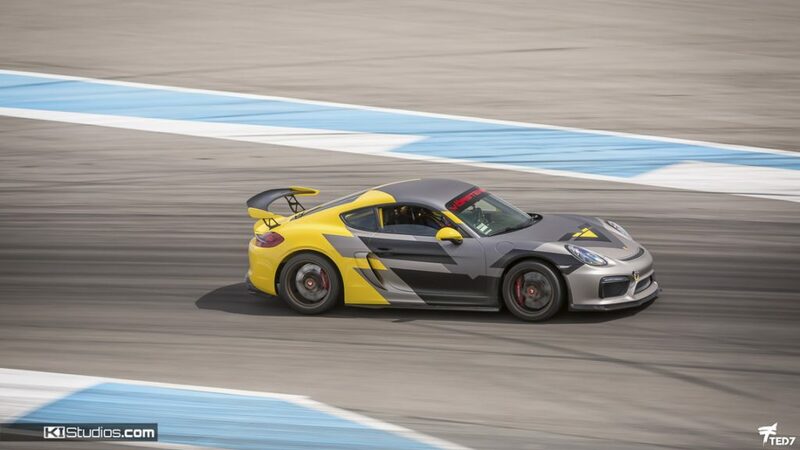 By the way, back when we first launched the Scuderia stripes for Porsche some years ago, the purists threw their hands up! 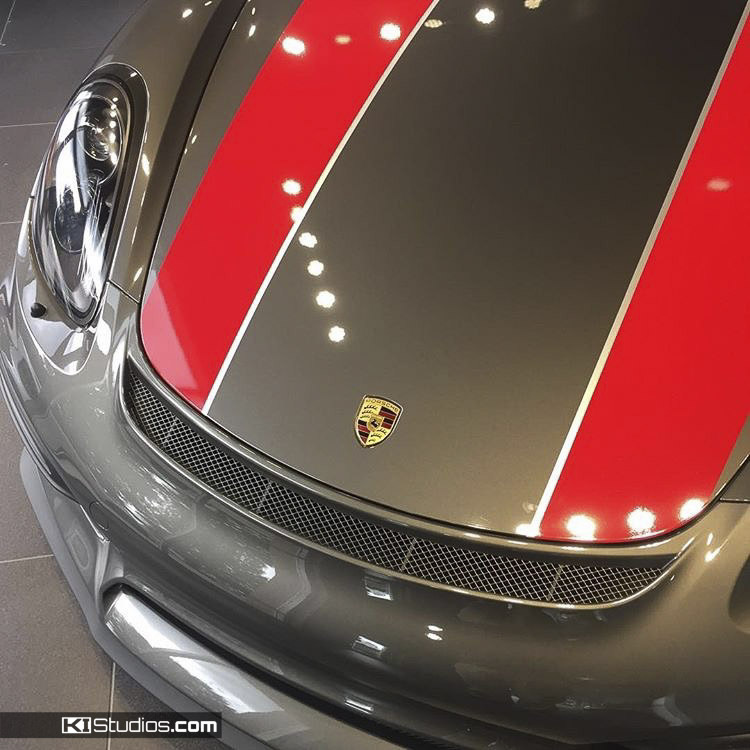 “No, that’s a Ferrari stripe!” It seems though that many Porsche fans love those stripes as we sell tons of them for all kinds of Porsche models. 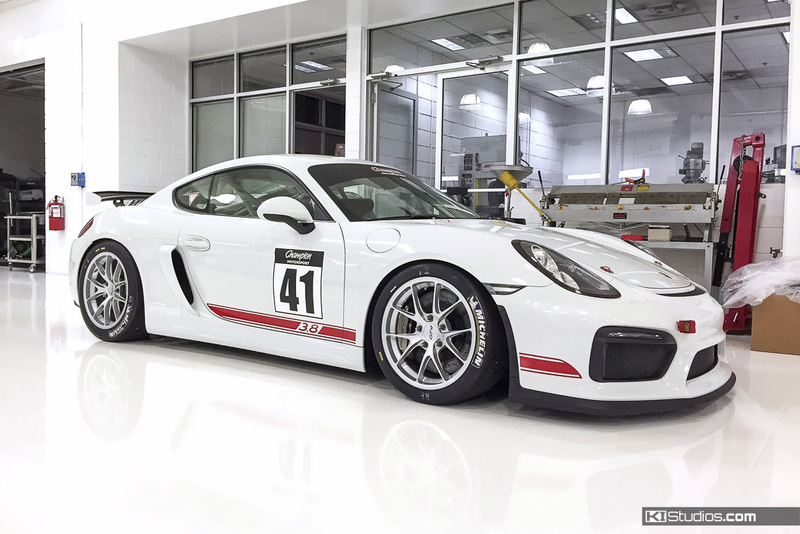 Many people searching for Cayman GT4 decals have ordered these as you can see in the photos. 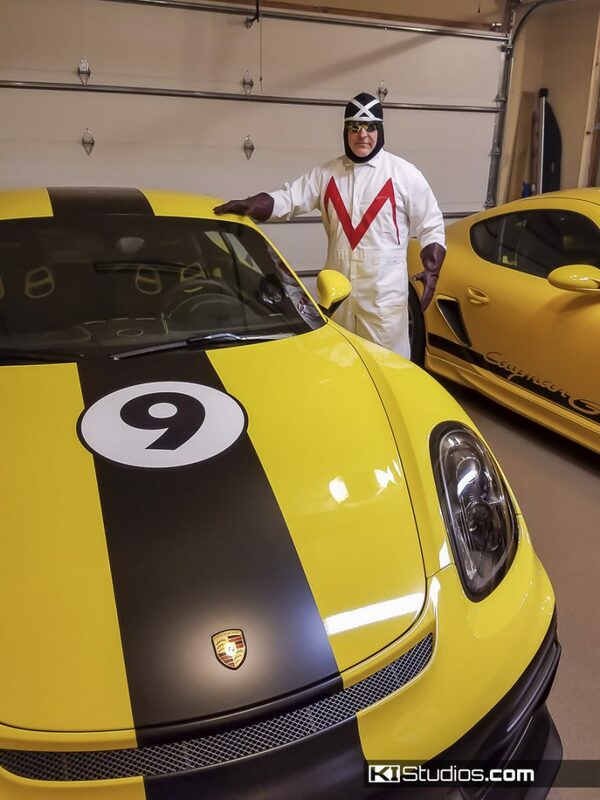 Custom stripes for Speed Racer. We can create any design you want and ship it to you. Not all the designs in these photos can be ordered from our stripe kit collection. We designed all of our stripe kits with the end user in mind. You. Meaning, DIY installation. That all said, you can get anything you want. We can ship you any custom design you want and you can have it installed professionally, locally, by a reputable wrap shop. Another GT4 custom design. This one we created for Vorsteiner. Thermal Club. Photo by Ted 7. If you are looking for Porsche 981 Cayman GT4 decals to add more boldness to your car, be sure to check out our collection of Cayman GT4 stripes. Some of the photos in this article were sent to us by customers for our KI Studios car stripes photo contest.